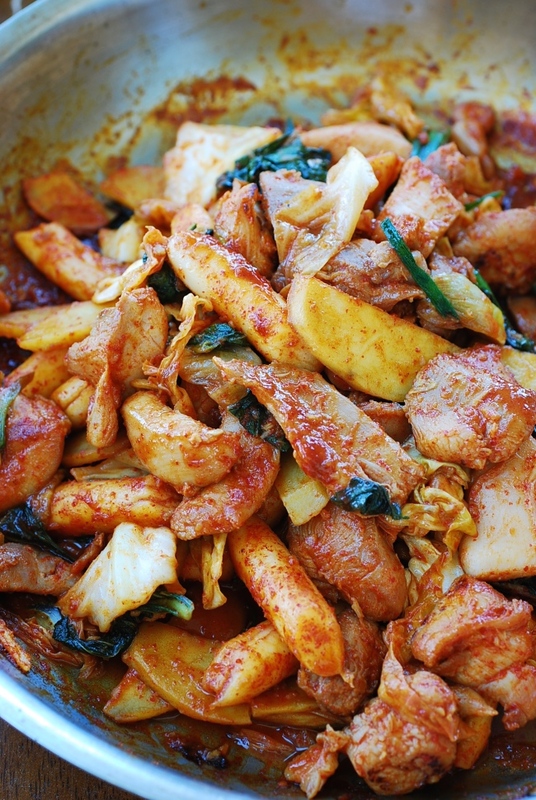 A spicy stir-fried chicken dish made with boneless chicken pieces, rice cakes (tteokbokki tteok), green cabbage, sweet potato, and other vegetables. It’s a restaurant favorite in Korea, but you can easily recreate at home with this recipe! 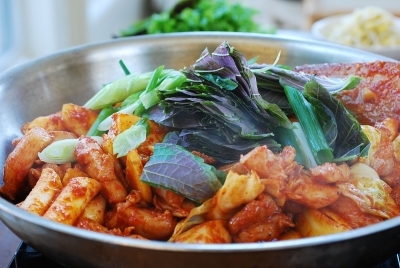 Dak galbi (닭갈비) is very popular all over Korea, especially in Chuncheon (춘천), a city in Gangwon Province (강원도), where the dish originated in the 1960’s. 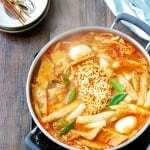 It is a spicy stir-fried chicken dish made with boneless chicken pieces, rice cakes (tteokbokki tteok), green cabbage, sweet potato, and other vegetables. Dak means chicken, and galbi means ribs. But, there are no ribs in this dish. 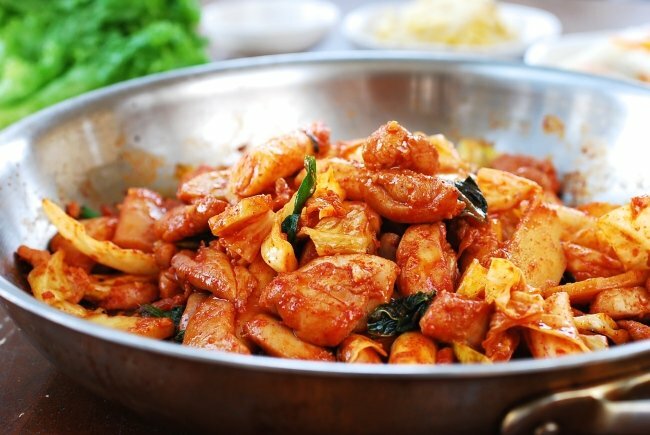 Back in the day, pork ribs (dweji galbi) were too expensive for everyday grilling, so a restaurant cook created a similarly flavored dish with chicken instead and called it dak galbi. During my recent trip to Korea, I took a day trip to Chuncheon with a couple of friends. I always loved the dak galbi I had in Seoul, but this time I wanted to experience the dish where it’s a local specialty. Chucheon is a small city which is about an hour driving distance from Seoul. It’s a beautiful city with mountains and lakes, but most of all it boasts hundreds of dak galbi restaurants. We went to the famous dak galbi alley with a high concentration of restaurants. We didn’t do any research before we went, so we just picked the one that looked busy from the outside. It was past lunch time, but the place was still bustling. Each table was equipped with a gas stove and a large round grill pan, which is pretty standard at typical dak galbi restaurants. We ordered 3 servings of dak galbi. Shortly after, the waitress brought out a tray full of red spicy marinated chicken, freshly cut cabbage and sweet potatoes, and rice cakes. She then dumped everything on to the pan that was being heated in the middle of the table. The chicken started to sizzle immediately, and the smell was incredible. We had to patiently wait for everything to be cooked through, stirring occasionally. 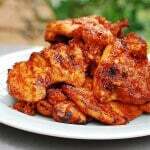 When the rice cakes and sweet potato pieces turn tender, the chicken is also ready to eat. We couldn’t stop eating! We ate some wrapped in lettuce and perilla leaves. The dak galbi tasted a little lighter and cleaner at this place than the ones I tried in Seoul. I liked it better this way. 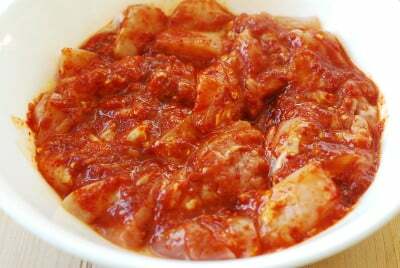 The sauce for dak galbi is made with staple Korean ingredients, such as gochugaru (red chili pepper flakes), gochujang (red chili pepper paste), garlic, ginger, etc. 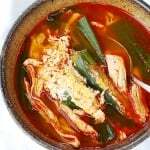 It sometimes contains Korean curry powder, which is a pre-made mixture. 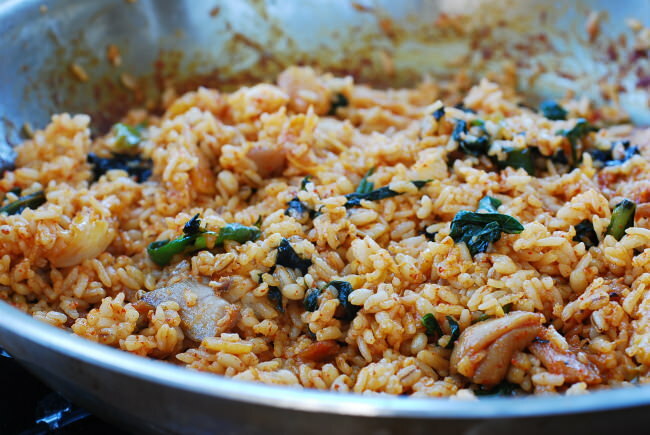 Dak galbi is typically not served with rice, but it’s customary to mix in some rice into the leftovers at the end to make fried rice. At restaurants, you have to order the rice separately to do this. We were very full, but had to have some fried rice. After leaving the restaurant feeling satisfied and full, we took a scenic ferry to a small island called Nami Island (남이섬), and walked around completely enjoying an early fall day. This popular restaurant dish is so easy to make at home. You can double the sauce recipe and keep the half in the fridge. You will definitely want to make it again soon. 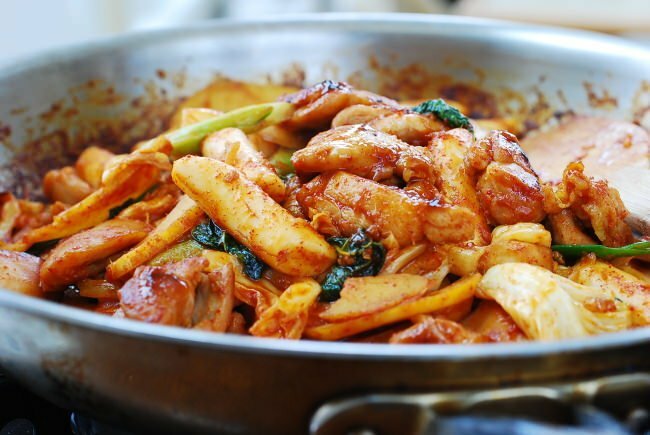 A spicy stir-fried chicken dish made with boneless chicken pieces, rice cakes (tteokbokki tteok), green cabbage, sweet potato, and other vegetables. 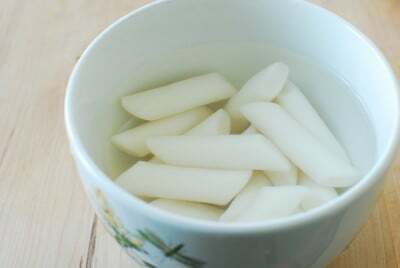 Soak the rice cakes in cold water for 10 to 20 minutes if hardened. Skip if using fresh rice cakes. Mix all the sauce ingredients well in a bowl. Cut the chicken into bite size pieces. Mix with the sauce (reserving one tablespoon if you’re going to make fried rice at the end) and marinate while preparing vegetables. Cut the chicken into bite size pieces. Mix with the sauce (reserving one tablespoon if you’re going to make fried rice at the end) and marinate while preparing vegetables. Cut the sweet potato in half lengthwise and then thinly slice crosswise and slightly diagonally. 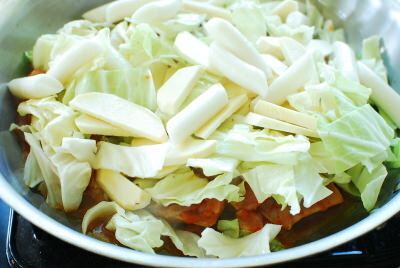 Cut the cabbage, kkaennip, and scallion into small pieces. Heat a pan over medium high heat. You can add a tablespoon of oil if you want, but this is not necessary. Add the chicken, sweet potatoes, rice cakes, and cabbages. Cook for 5 minutes, stirring occasionally. Lower the heat if the ingredients (especially the rice cakes) stick to the pan. The steam from the vegetables should keep them from sticking to the pan. You can also add a couple spoons of water if the pan gets too dry. Add the kkaennip and scallion and cook for another 3 to 4 minutes until the rice cake and the sweet potato pieces turn soft. By then the chicken should be cooked through. Add the rice to the pan along with the reserved sauce and sesame oil. Stir constantly until everything is well incorporated and the clumped up rice is broken up, about 5 minutes. Scrape up the flavorful brown bits from the pan while stirring. 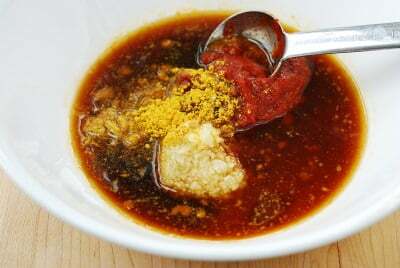 Mix in the dried seaweed and sesame oil. Thank you! Hope you make it soon. I made this several weeks ago for my family and, while tasting good, there was something missing that turned me off from the dish. But since then and after moving into my new apartment for summer school, I remade the dish; this time making sure to get all the right ingredients. Then after a remarkably short prep and marinade, it came out to delicious results. I am completely grateful to you for sharing this recipe and your culinary knowledge with me. 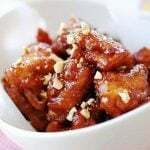 I have always loved Korean food and longed to be able to cook it. I am very happy to now have a wide variety of dishes readily available in my bookmarks due to you! In my area I have not been able to find any perilla leaves. 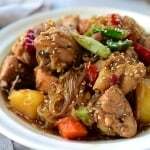 How important are they to this dish and Korean food in general? Do you have any suggestions on how to get them? I used mint as substitute and it really stuck out awkwardly. Also I used my local variety of sweet potatoes instead of Korean. I actually really liked this substitution ( though I do not have memory of Korean Sweet Potatoes to compare ) and I realized how important it is to slice them thinly. I would either have a delicious and tender slice or a thicker and harder one. Another thing is I really enjoy spicy food. This is one reason why I enjoy Korean food so much as it seems so naturally conducive to spice. What would you recommend in raising the heat profile? Sorry for the late reply. I just realized I had missed your comment. I am glad you tried it again with the right ingredients, and it came out delicious for you. 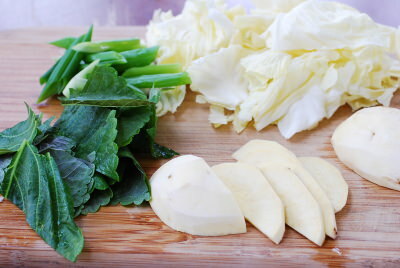 Perilla leaves are an important ingredient in Korean cooking. 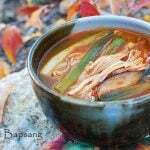 It is a fragrant herb that is widely used also as a vegetable in Korean cuisine. If you can’t find it, you can omit it. Yes, mint will be quite strong in its unique way and not work well with this dish. To increase the heat level, you can use more gochugaru (red chili pepper flakes) or add some sliced fresh hot green or red chili peppers. 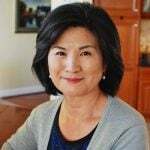 And thanks for creating this site– so far I’ve only tried making the spicy shrimp but they turned out really well, and it’s really really hard to find a Korean restaurant where I live that makes really good 돼지불고기 or 닭갈비, so I’m excited to try making your recipes for these and more! Hi there! This dish looks amazing! I just have a question, can I substitute the rice wine with rice wine vinegar? Or something else maybe? You can use white wine if you have any, or omit it. No vinegar. Sake is an excellent substitute for mirin/rice wine. Because this recipe uses sugar, the slightly dryer nature of sake will work perfectly. As an American living and teaching in Korea for more than a year, I’ve developed quite a taste for so many Korean dishes. I absolutely love to cook, but for some reason haven’t tried cooking any Korean dishes since we moved here until very recently…using two of your recipes. I am happy to say this is spot on! 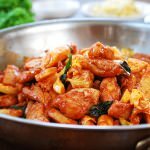 It tastes just like our favorite Dak Galbi restaurant, if I do say so myself:) Thank you for sharing these easy to follow recipes! Oh nice you’re in Korea. Sounds like you’re really enjoying Korean dishes. I am glad you started to cook on your own as well, and I am happy to be helpful. Thanks for the nice words! I love your recipes! I used to have absolutely NO interest in cooking but thanks to your website, I want to cook something different every week and every recipe of yours I’ve tried has come out great! I’m thinking of making this for my family, but my mom doesn’t eat spicy food too well. She can handle a medium amount of heat, and I’m thinking the cheese will cancel out most of it, but the best way to make it less spicy would be just to put less gochujang, right? Sorry if it’s an obvious question and thanks!! 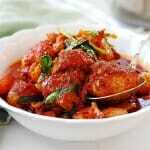 Hi Olivia – Wow so good to know my recipes are inspiring you to cook more! Actually the best way is to reduce the gochugaru (red chili pepper flakes), which is actually the primary source of heat. You would want to keep the gochujang for the flavor and the salt level. Yes, adding cheese will help as well. Thank you, and let me know how it turns out for you and your mom. I also didn’t have any kkaennip or rice wine so I have yet to actually know this dish in its’ full glory, but it’s still a dish that I’m willing to try again!